Amazon has the gorgeous and highly reviewed Russell Hobbs 2-Slice Retro Style Toaster in many colors for $79.99 shipped! From your gas range to your stainless steel refrigerator you’ve carefully selected every appliance to match your kitchen’s style. Why stop there when smaller details can add the all-important finishing touch? Make your kitchen feel little more distinguished with the eye-catching Russell Hobbs 2-Slice Retro Style Toaster in our premium polished black finish. 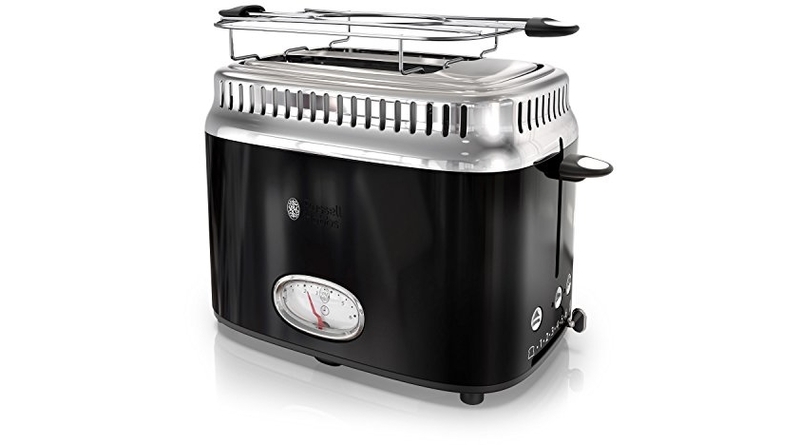 Classic retro-styling meets modern innovation for premium toasting performance. This 2-slice toaster features a countdown timer that shows precisely how much time remains on the toasting cycle. The variable browning control ranges from 1 (light) to 6 (dark) to satisfy all preferences. Choose the Bagel function for a perfectly toasted cut side with a warmed bottom side or the Frozen setting for fresh-like results. This toaster comes with a removable warming rack that quickly heats buns, pastries, and rolls. Plus, the removable crumb tray ensures easy cleanup.